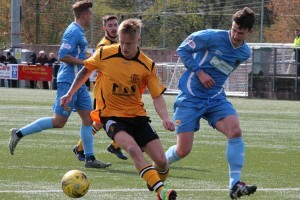 Annan Athletic maintained their push for one of the play off positions with a narrow but deserved victory over Berwick Rangers who now find themselves in the mix as one of the teams likely to end up in the bottom position. It was an important match for both teams for different reasons, chances were limited but the match was eventually decided in the 70th minute by a superb clinical Aidan Smith strike. Annan boss Jim Chapman’s hands were once again tied with Steven Swinglehurst suspended and Jordan Stewart injured it presented another opportunity for Stephen Bronsky to partner Raffi Krissian at the centre of the Annan defence and Stephen Black was recalled to fill the right back slot. Annan started promisingly and when Scullion fouled Aiden Smith in the 4th minute it provided an opportunity for Weatherson but the 20 yard effort was blocked with Gavin Skelton blasting the rebound over the bar. Blair Currie pulled off a save to deny Lavery minutes later as Lavery homed in on the Annan keeper. Weatherson’s header from a Flanagan corner went narrowly past the post in the 12th minute. Berwick carved open their best chance of the half in the 17th minute when Darren Lavery’s cross from the right was headed narrowly over the bar by Greg Rutherford. Gavin Skelton’s effort from the edge of the box was easily saved by Sean Brennan but minutes later Skelton and Weatherson combined superbly to cut open the Berwick defence who were fortunate when Weatherson’s effort struck the cross bar. It was the nearest either team came to scoring in the opening half. Berwick started the second half brightly but it was Annan who struck first in the 54th minute when the lively Aidan Smith was fouled by Lee Hamilton just inside the box, the referee took a second to award the penalty with Darren Ramsay making no mistake from the spot. Aidan Smith was a thorn in the side all afternoon then looked to have won Annan another penalty in the 56th minute when keeper Sean Brennan appeared to take the Annan striker out but this time the referee waved play on. Darren Lavery’s effort from 25 yards sailed over the bar in the 66th minute and at the other end Weatherson set up Max Wright who shot narrowly past the post. Berwick squared the match in the 67th minute after Jean Guy Lucas conceded a free kick 20 yards out and Steven Thompson stepped up and his well directed free kick flew into the top corner of the net. Berwick however could not build on their success and 3 minutes later Annan struck again when Weatherson held the ball up before releasing Aidan Smith who cut in from the left to finish with a fine low shot across the keeper and into the net from 12 yards. It was just reward for the Annan striker who was a constant thorn in the side to the Berwick team all afternoon. David McKenna replaced the injured Max Wright and almost immediately Annan’s top goal scorer was presented with an opportunity when Ramsay released the striker one on one with the keeper who managed to smother the ball under his body. The victory keeps Annan in the play off zone but the title is still wide open with both Forfar and Arbroath being defeated. Montrose dented Forfar’s hopes with a 1 goal victory and Arbroath lost an injury time goal to Edinburgh City to earn City 3 precious points at the bottom of the table. Stirling Albion’s play off hopes look doomed following a 3-0 home defeat at the hands of Cowdenbeath who despite the victory still remain rooted to the bottom of the table. Elgin went into a 2 goal lead but were undone by a second half David Gillwillie hat trick as Clyde picked up 3 precious league points. ANNAN ATHLETIC : Blair Currie, Steven Black, Jean Guy Lucas , Raffi Krissian, Steven Bronsky, Gavin Skelton , Max Wright ( David McKenna 70 min), Darren Ramsay, Peter Weatherson ( Smart Osadolor 88 min), Aiden Smith, Nathan Flannigan ( Rabin Omar 66 min). Subs not used Callum Home, Barry Cuddihy, Tom Fry, Alex Mitchell. BERWICK RANGERS : Sean Brennan, Lee Hamilton, Kevin McKinley ( David Verlaque 39 min),Steven Notman , Pat Scullion, Euan Spark, Steven Thomson, Darren Lavery, Greg Rutherford, Sean Murdy ( Michael McKenna 20 min), Gary Phillips ( Arron Murrell 85 min) , SUBS NOT USED: Daniel Watt, , Ricardo Leao Kessess, Renne Donkeb, Grant Goodfellow GK.